From the moment I doused my neck with Urban Outfitter’s Fleur Monoi, it reminded me of the summer and freshly washed curls. Named after the yellow-and-white Tahitian flower, the eau de parfum smells like a humid beach: creamy, but not heavy, floral but not painfully synthetic. With a blend of coconut and gardenia notes, it is a very mellow scent. Though many scents ring tropical or beachy, Fleur Monoi is the coolest, most relaxed fragrance of the bunch. I imagine it’s how the huts smelled at the Tahitian resort where the Kardashians vacationed a few years ago, or how Hawaii smells every day of the year. It also smells just like Carol’s Daughter’s Monoi Hair line. 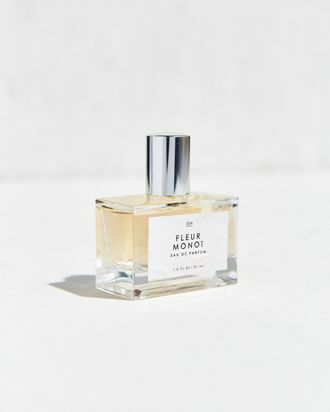 Fleur Monoi isn’t a particularly fancy scent, but it’s comfortable, simple, and easy. You might say that it smells like a tranquil vacation: something I’ll keep in mind the next time I wear it, like next Monday, while sitting at my desk. Fleur Monoi, $18 at Urban Outfitters.